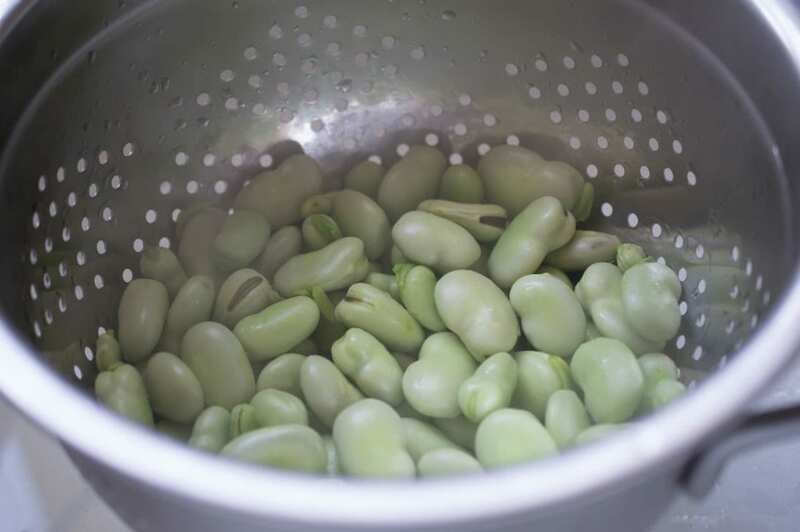 The other night when I came home with our weekly CSA haul, I enlisted my dear husband in helping me shell a couple pounds of fava beans. 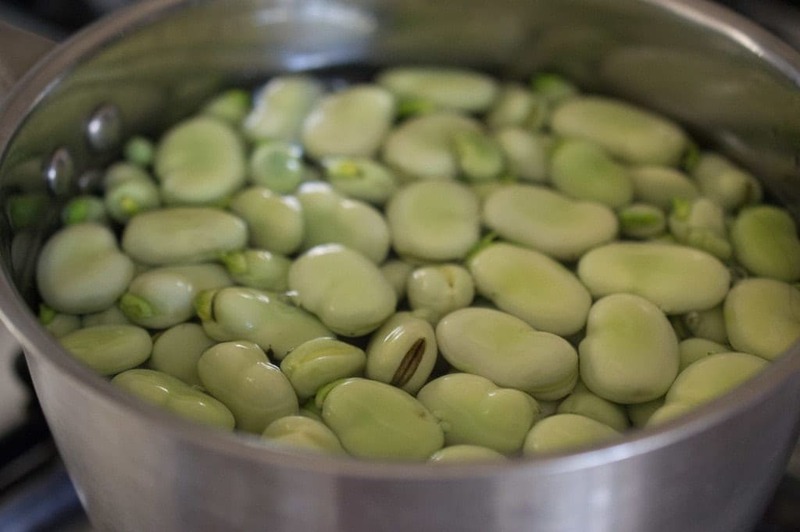 The next morning, I blanched them and removed their tough outer skins, tossing a freshly peeled bean to him as he was running out the door to work. It was his first fava bean ever, and he seemed to like it! It’s been lots of fun getting Brendan to try different vegetables. 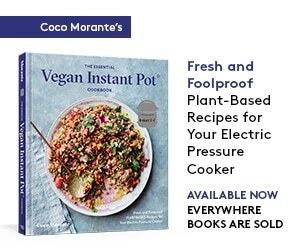 Before we met (and shared a kitchen), he’d never tried beets, sorrel, rutabagas, kale, and I’m sure some more things I’m forgetting right now. He’s always up for tasting something new, and he’s liked most everything I’ve brought to the dinner table. But back to those fava beans. After Brendan tried his first and only one, I sautéed the rest of them in olive oil with lots of toasty garlic, green onions, basil, and a pinch of salt. And then ate the entire batch myself. All that is to say, these were so good that I couldn’t help myself from scarfing them all before poor Brendan got to have a single bite. I suggest you make a double batch — all of the shelling, blanching, and peeling is truly worth it, and you’ll want to have plenty to share. 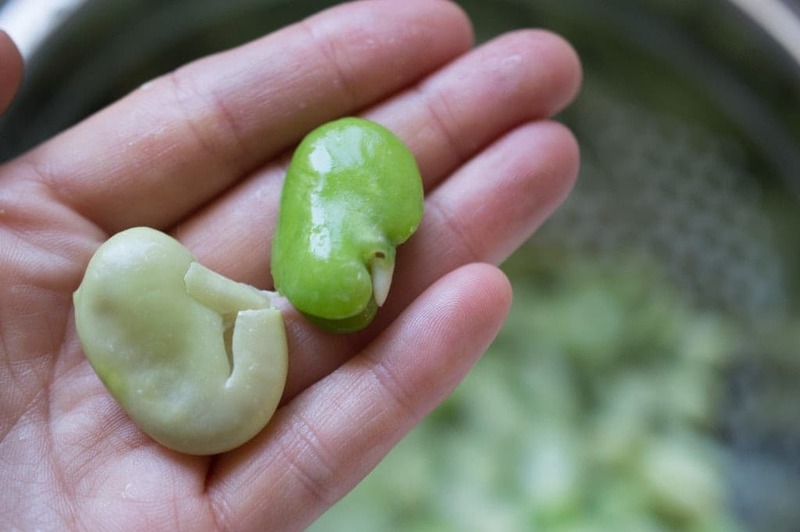 Before you can make the recipe below, you’ll have to get the fava beans into their naked state. It’s a simple, but slightly time consuming task — get someone to help you and it’ll go much faster. 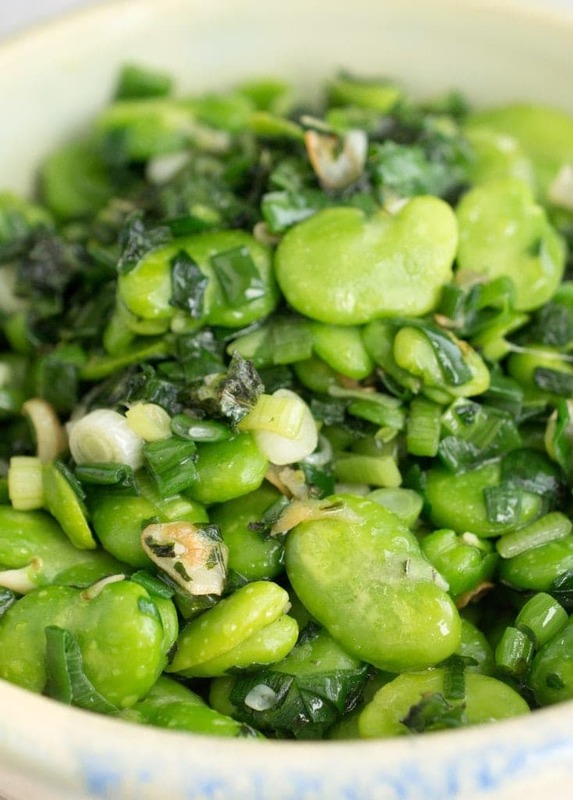 First things first, you need to remove the fava beans from their fat, fuzzy, inedible pods. Discard the pods, then . . .
2. 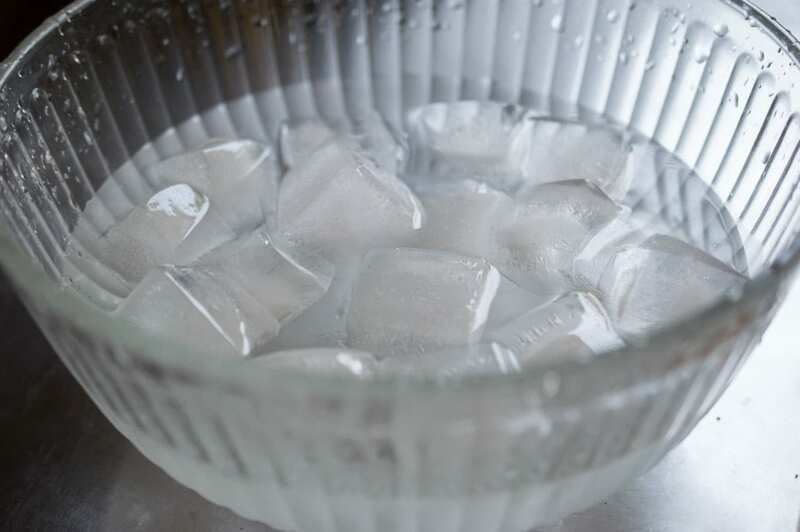 Prepare an ice water bath, and put a pot of water on to boil. They’ve still got a light green outer skin that is pretty tough and unpleasant to eat, but it’s easy to remove. 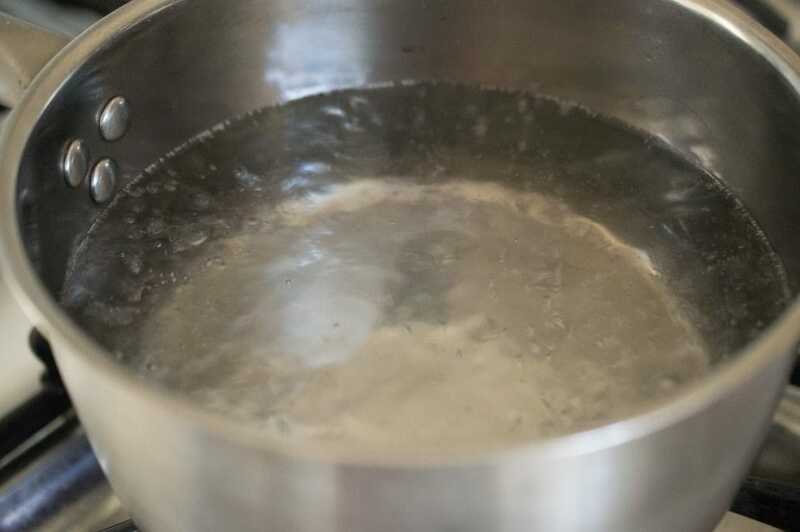 Simply boil a pot of water, add the beans, and let them cook for about a minute, just until the water starts to come back up to a simmer. You’re not trying to cook the beans through, but just loosen the outer skins. 4. Drain, then shock the beans in an ice water bath. 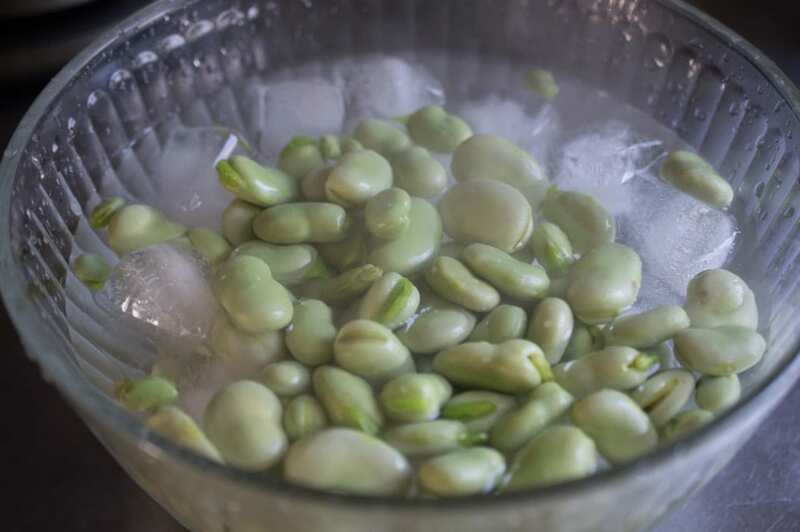 The ice water will quickly cool the beans so they’re comfortable to handle, and also cause their skins to shrivel and loosen. 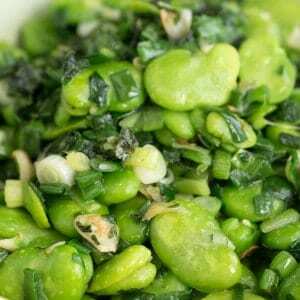 You’ll discard the tough outer skins of the beans — what you want are the vibrantly green inner beans. Try to keep them intact, but don’t fret if a few break or split as you’re peeling them. And that’s it! Congratulations. 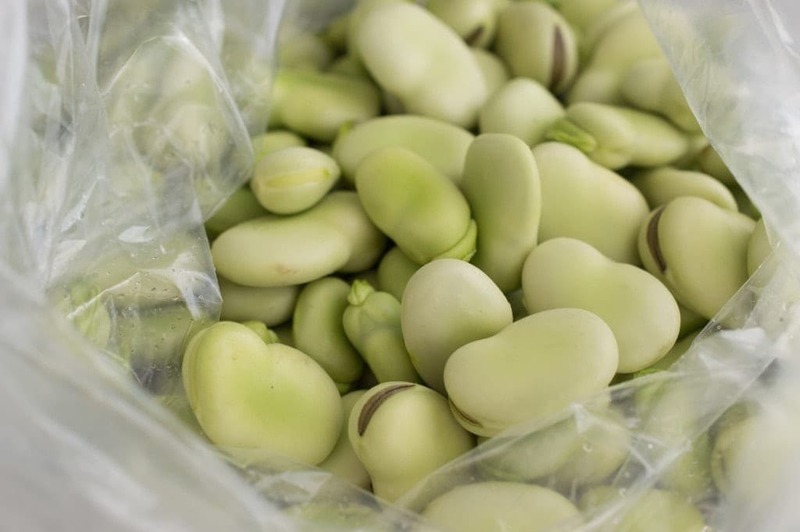 You’re now a fava bean prepping expert. 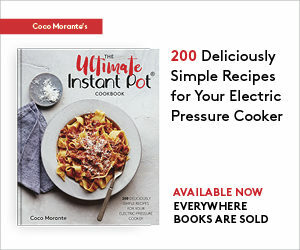 It’s time to cook them up and enjoy the recipe below! 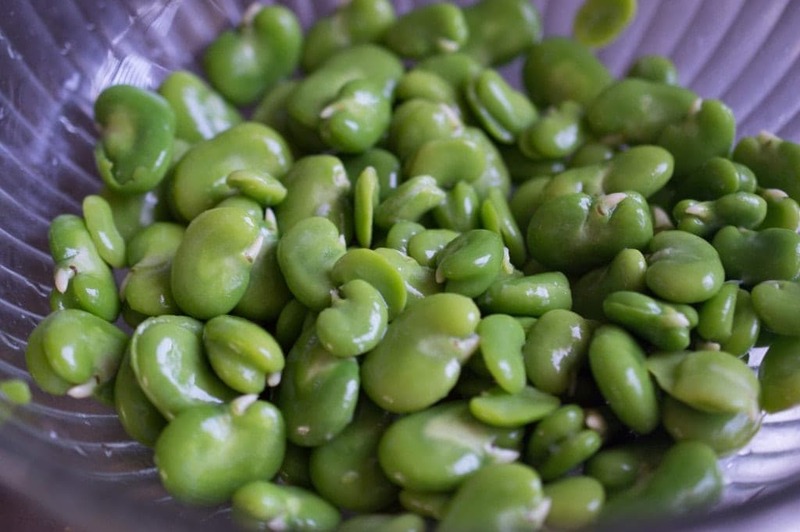 Fava beans are so fresh and tender and wonderful. 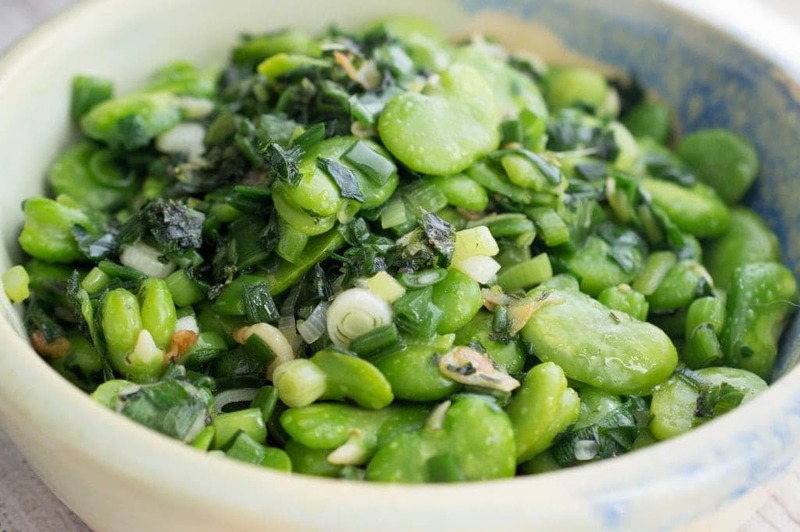 They're my favorite spring vegetable, and this simple preparation shows them off to their best advantage. In a large (12-inch) skillet, heat the olive oil and garlic over medium heat. 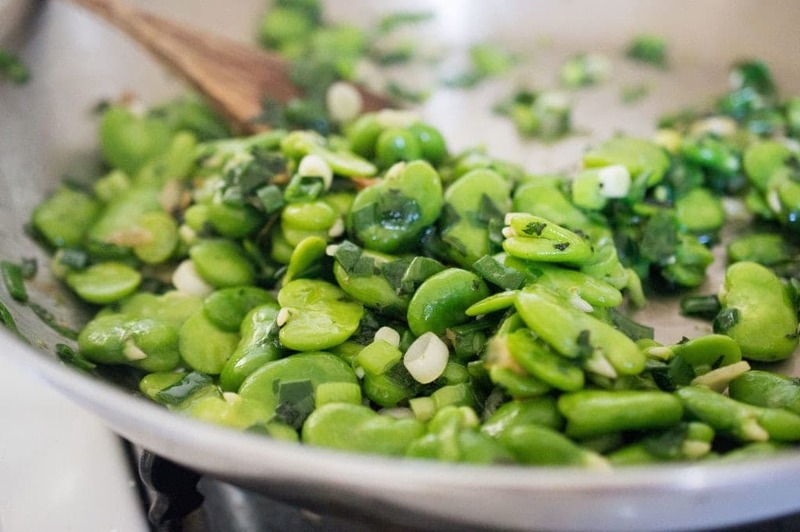 When the garlic is just beginning to brown, add the fava beans, green onions, and salt to the skillet. Sauté until the green onions are wilted and have lost their raw bite, about three minutes. Add the basil and sauté for just about one more minute, then turn off the heat and serve right away.